Opportunities are available across our Backstage, Technical, and Learning and Participation departments. The Royal Opera House is currently recruiting eight new apprentices to join in September 2015. 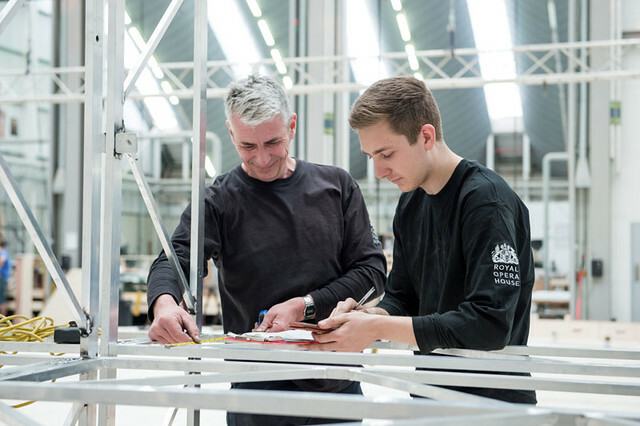 Since 2007, the Royal Opera House has been offering apprenticeships in our Backstage, Technical, and Learning and Participation departments, providing opportunities to learn from some of the best-skilled people in the industry. Read Paddy, Sophie and Lucy’s Apprenticeship Case Studies here. The closing date for applications is 8am on Monday 1 June. See full details of our apprenticeship scheme and how to apply. You can learn more about the Royal Opera House Apprenticeship Scheme by visiting our free exhibition offering an insight into the training opportunities available in the arts. Go to the ‘Visit Us’ page on our website for information for opening times. Apprenticeships at the Royal Opera House are generously supported by the Derek Butler Trust, the Ashley Family Foundation and the Gordon Foundation. I'd love the opportunity to work with the Royal Opera house as i love coming here with my family. I'd really love to apply for the apprenticeship scheme but unfortunately I see that I have missed the deadline. I wonder if it would still be possible to apply? Will there be any more vacancies for the apprenticeship for this year that I can apply for? Apprenticeships run alongside the college year so I'm afraid you've missed the deadline for this coming September. I am currently looking for apprenticeships for next year and have had my eye on an apprenticeship with ROH for a few years now. Id really love to do the costume performance support and footwear apprentice, and just wanted to register my interest in advance for the scheme as i have attended a workshop with the ROH and aim to do so again soon. It's brilliant to see that the Royal Opera House offers these fantastic opportunities - it's hard to think of a more prestigious company that you could work for! It's also great to see that these positions aren't just 'making up the numbers' and that apprentices get real responsibility. Lucy summed it up perfectly - ‘So just really believe in your potential and others will see it too.’ That's what it should be about. I recently compiled an infographic of my own about why apprenticeships are so great for young people - let me know if you'd like to take a look. This site also has plenty of career advice aimed towards school leavers, so is a good resource - http://www.ratemyapprenticeship.co.uk/apprenticeships. I'm really interested in the costume performance support apprenticeship for the school year starting September 2016. Is there anyway you can say for certain that the apprenticeship will be offered next year?? I'm afraid that we cannot say for sure which apprenticeships will be offered in future. Do sign up for our vacant alerts if you would like to be notified of future opportunities.